We own a public relations and design company, so we were really interested in making our wedding invitations. 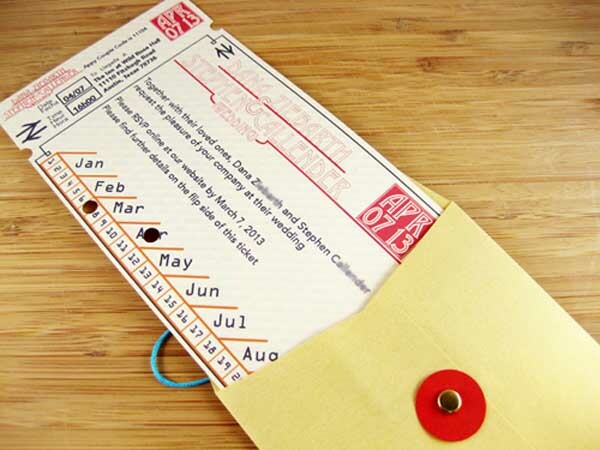 I designed them with inspiration from my old train tickets from London to Paris that I’ve been using as bookmarks. The couple’s invitations were enclosed in #10 Open End Shimmer Gold Envelopes with a string and button enclosure that was fashioned by hand. They printed #10 Savoy Cotton Notecards at home to achieve the faded look, then finished with rounded corners. Using a perforating wheel the couple created a tear-off piece that could be placed in purses and wallets, and the black strip across the top is magnet tape for refrigerator posting. They also included a QR code on the rear. With a scan of a smart phone, guests are taken to either their Adroid or iPhone app store to download the couple’s wedding app. With their know-how and creative thinking – and the help of basic note cards and envelopes – the couple created a project that instilled the essence of their wedding’s theme. We were truly excited to hear from Stephen, and equally excited to share his project. Gorgeous! 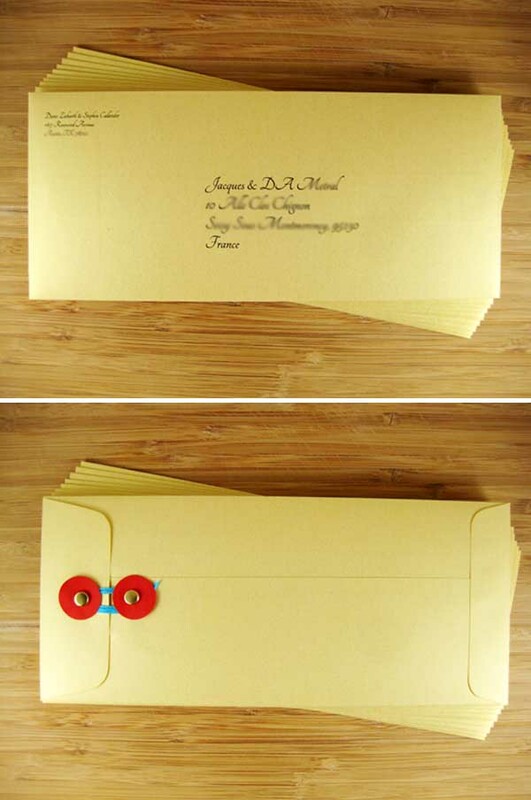 I love the creativity placed in designing and creating the paper invitation. When you added the bar code to download the wedding app, it added an interesting and modern dimension. Very clever. I am curious if the addressed Shimmer Gold Envelopes were printed on a laser or inkjet printer or if the envelopes were hand-addressed? Thanks so much! The envelopes were pretty tricky. Our home printer wouldn’t accept the #10 size, so we ended up taking them to a local print shop where a friend figured it out for us. It’s challenging to find a commercial printer who will even agree to try printing on #10 envelopes. However, if you’re concerned about the Shimmer Gold paper finish taking printer ink, it did just fine and looked perfect. My company actually printed the envelopes. They were printed on a full-color laser envelope printer. We loved helping Stephen and Dana put these beautiful invitations together! Amazing. These envelopes are really designed by lots of creativeness.